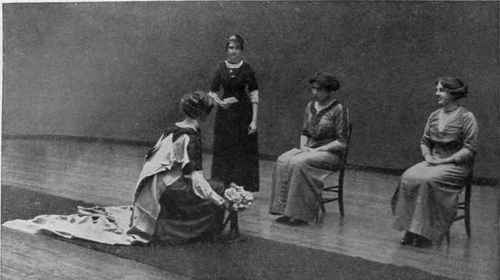 How the debutante should enter the Throne Room and present her card to the Lord Chamberlain, represented at the rehearsal by the figure on the right. Her train is shown as it would appear after being spread at the entrance by the pages. Rehearsing the first curtsey to the King. In the class the seated figures represent their Majesties. The debutante should hold her bouquet in her right hand just beyond the right knee as she sinks gracefully down in her obeisance. In the first place, a Court curtsey is much lower than an ordinary curtsey, and quite different to the curtsey in a minuet or gavotte, where the front foot is extended. A Court curtsey is always made on the right foot. The learner should practise standing with her feet slightly apart, then move the left foot sideways and a little forward. Next draw it gradually round with a circular movement till it is behind the right foot, but not touching it, and resting on the toe only. Then bend both knees, sinking gradually towards the ground, and bending the head slightly forward. The greater part of the weight is on the right foot when bending down, and is transferred to the left foot on rising. This is done slowly when the learner has bent down as far as possible. The body draws back a little towards the left foot, which bears all the weight, so that the right foot is perfectly free to start a second curtsey or to walk on. This curtsey should be practised carefully and slowly till it can be made without jerks either when sinking or rising. 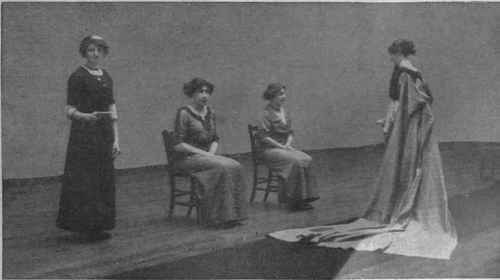 And the learner must be careful not to stoop forward from the waist when doing it, but only to incline her head gracefully as her knees bend. 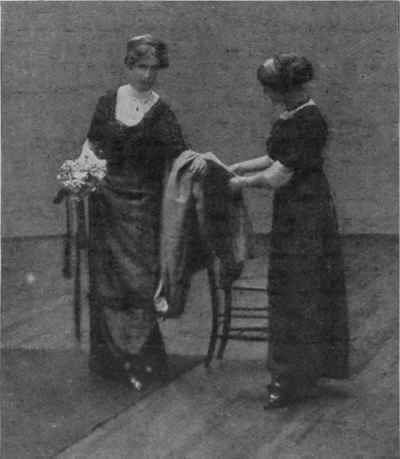 After her second curtsey, which is made to the Queen, the debutante should rise into the position illustrated, and move train sweeping behind her, and the regulation bouquet held in her right hand! 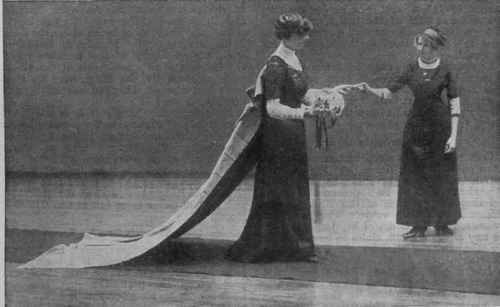 When the debutante reaches the exit door of the Throne Room, she should turn and extend her left arm for a page (the figure on the right) to place her train over it. Do you think you could master the court curtsey? That seems like an awful lot of work just to see Their Majesties for a few minutes. LOL, I always trust your comments to shoot for the ridiculous! I wonder if there is any record of women who fell or tripped during the court presentation? I haven’t found any, but I do recall reading about a suffragette debutante who used her presentation to shout at George V to let women have the vote! I had read somewhere that after you were done with your curtsies, you had to back out of the room (with your train behind you). What I wonder is how they did that or had it changed by the time these photographs were taken that one did not have to back out of the room. What’s funny is that I have yet to come across any reference to ladies backing out of the Throne Room in any etiquette books! I think it might be one of the many things Georgette Heyer made up to confound copy-cats, and has unwittingly become a historical “fact”.